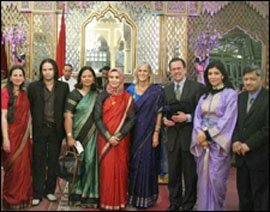 The spouses of the US and Bangladeshi ambassadors to Morocco, Nancy Riley and Nina Al Haroon, respectively, have recently organized a Bangladeshi evening at the Tazi palace in Rabat to raise funds on behalf of the Red Crescent Social Educational Center (RCSEC) in Rabat. At the evening, silks, saris, and Bangladeshi Arts were open to sale. The evening was attended by several members of the diplomatic corps, an association of spouses of Ambassadors in Morocco. The guests enjoyed Bangladeshi food at the sounds of 'Les Frères Akkaf' band and Aissaoua music Group. Bangladesh is famous for its distinctive traditions, and delicious food, snacks and savories. Boiled rice constitutes the staple food, and is served with a variety of vegetables, fried as well curries, thick lentil soups, and fish and meat preparations of beef, mutton, and chicken. Sweetmeats of Bangladesh are mostly milk based, and consist of several delights including Roshgulla, Sandesh, Rosmalai, Gulab Jamun, Kalo Jamun, Chom Chom. Some of the young girls from the Red Crescent Social Educational Center made the “hors d'oeuvres” and helped serve the dinner. The girls expressed their happiness and enthusiasm to be a part of raising funds for their own center. Nancy Riley, who visited the educational center few months ago, said that it is an excellent example of teachers and students working well together to train young men and women for good jobs and great futures. Impressed by the center's work, Nancy Riley invited other spouses of ambassadors in Morocco to pay a visit to the center. Visiting the secretarial, nurse, computer and language classes, and watching hairstyles being created, the visiting VIP's noticed that the center needed some supplies, equipment and a little push to progress in their work. “So we decided to have the fundraising event,” Riley told Morocco Times. “The spouse of the Bangladeshi Ambassador, Nina Al Haroon is a fabulous cook, and agreed to prepare the food for a gala 'Evening in Bangladesh', making the guests travel to Bangladesh and get to know some aspects of this culture through the evening," she added. The Social Educational Center is a project of the Moroccan Red Crescent, a non governmental organization created in 1957 by HRH Princess Lalla Malika to assist and improve the lives of vulnerable people at risk from situations that threaten their survival, or their capacity to live with an acceptable level of social and economic security and human dignity.